One of my favorite things to do (seriously) is organize. I love having everything in an efficient place and I love when things in our home are accessible to everyone… including the preschooler which brings me to Organizing for Your Preschooler. Over the years, I’ve found some quick and easily solutions that help keep M’s things not only organized, but stored and displayed in a way that is easy for her to maintain (meaning clean-up and getting ready become infinitely easier!). M has a lot (and I mean a LOT) of hair bows. I like them to be displayed (and not in a jar) so that she can easily which one she wants to wear each day. My hubby took an old frame (garage sale!) and staple-gunned chicken wire (from the hardware store) to the wood. We hung the frame and now the hair clips easily slide off and on. 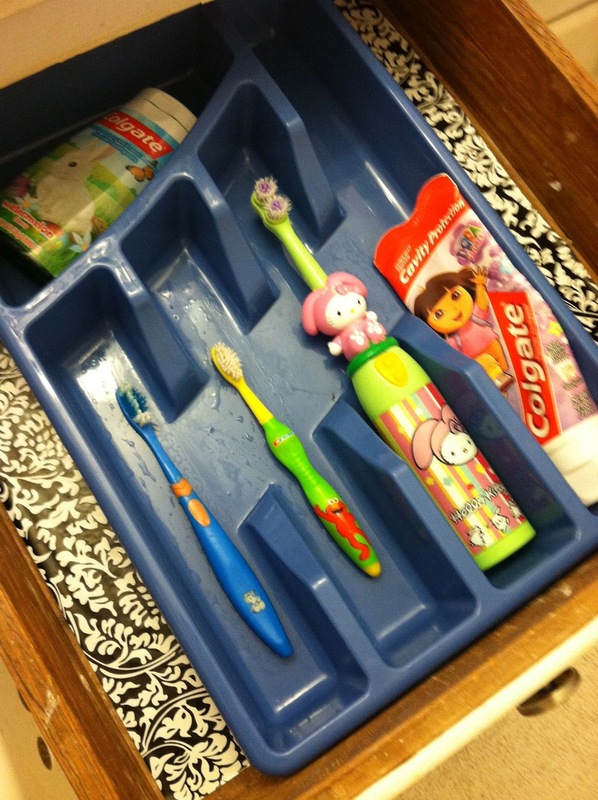 In M’s dresser, I placed some simple plastic baskets in to help separate the different items. This drawer holds tights, socks, and undies. M is quickly able to select which ones she needs and also is able to put away clean clothes easily! We are big hand washers over here so we pushed a stool right up to the sink in our hall bathroom. 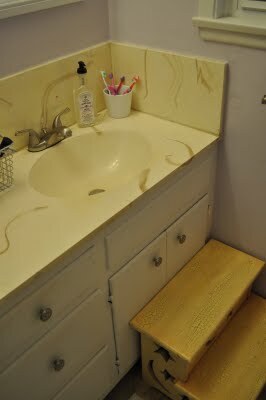 This is a sturdy wooden stool but in our other bathroom, we have THIS great Ikea stool. Making it easy for M to access means that hand washing is just a habit. Another great solution we’ve installed is in the area of teeth. 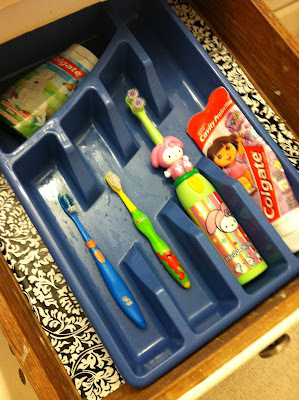 I picked up a utensil tray at The Dollar Tree and it keeps M and G’s brushes and toothpaste separated and organized. Every few days, I just take the tray out and wipe it down. Our kiddos’ rooms are fairly small so most of the toys are kept/concealed in the family room. We love our Ikea Expedit system to keep everything contained and hidden away. 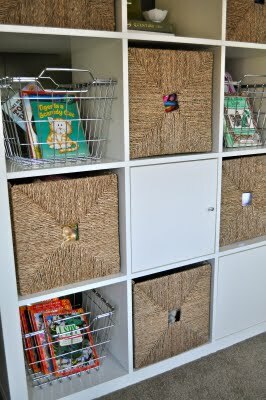 M can easily access the woven baskets and I filled some wire baskets (from The Container Store) with just a select few books that we swap out monthly. M really enjoys the changing selection of books and I’ve found that she’s more interested in just a FEW books, rather than a bookcase stuffed with an overwhelming amount of books. In my dream home, we’d have a mudroom. In my current home, we utilize the space behind the door. I hung up a curtain rod and added some S hooks, which make the perfect place for M to immediately hang up her backpack (and also sweaters and umbrellas) when we get home. 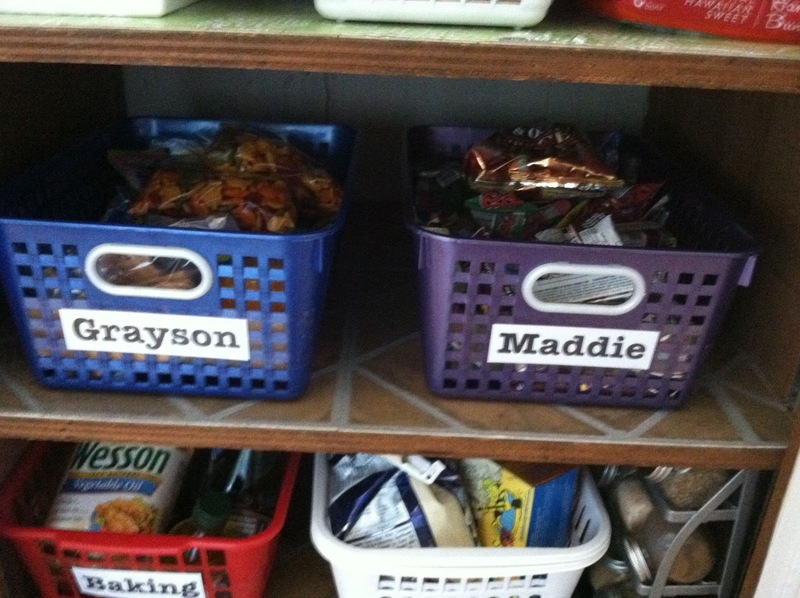 Each M and G have their own snack baskets, which I keep stocked and fresh. In M’s basket, she has things like fruit snacks, boxes of raisins, individually bagged pretzels (as soon as I buy a bag of pretzels, I divide them into snack-size Ziplocs or reusable bags), and granola bars. It gives her so much freedom and choice when she gets to select her own snack! How do you keep your home organized and accessible to the preschoolers in your family? 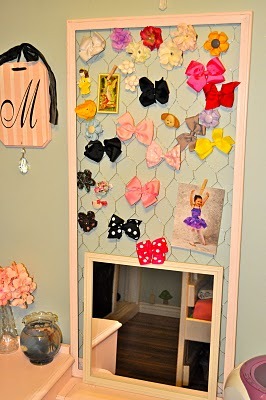 Wow really good ideas , i love them all.. ..im doing the bow frame this weekend! Thanks so much! Love these ideas!! They are awesome! I love the toothbrush holder! Great ideas! I think I’m going to do the baskets-in-dresser-drawers thing for the boys. I love the bow frame! That is really a clever idea. My daughter could fill one of those up fast. I might need to make one now . . .
Wow. I’m impressed. I wish you’d come and organize my messy nest. These are awesome ideas! I try to keep a couple of baskets of toys available, and most of our books are in a closet so they are out of sight…not that my kids don’t look at books, but they have to ask me to get into the book closet, so it stays a bit more organized. 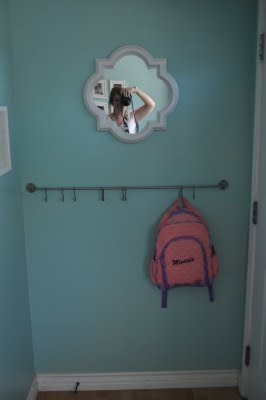 As far as clothes/hair accessories, my kids share a closet, and my daughter has a basket in the bathroom that keeps all of her hair accessories. I really like the idea of displaying the bows though! Great ideas! “Mudroom” and snack bins will be my mission this weekend. Love the great ideas, thanks!! !